Depression is a disorder in the brain that can occur for genetic, environmental, or chemical reasons. Depression typically develops between 15 and 30 years of age, and is more common in women than men. Women can also develop depression after giving birth, known as post-partum depression, or during menopause due to fluctuation in hormones and mood levels. No matter the reason, the following are signs and symptoms of depression - both psychological and physical. Depression can cause a change in appetite. While many people experience a drastic loss of appetite and thus lose weight rapidly, others binge on food to fill an emotional void. If you are suffering from depression, it is important to monitor your food intake, not only to make sure you aren't overeating, but to also make sure you are eating enough. Nutrition levels can affect mood and hormone balance. 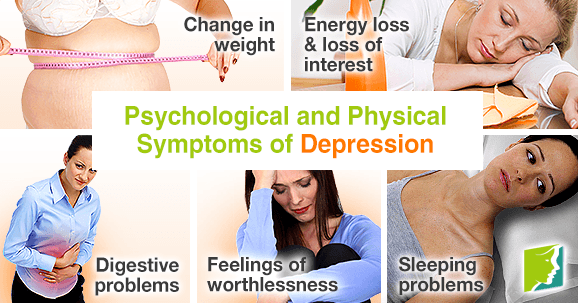 Fluctuation in weight could be a sign of depression. It is not uncommon to feel lack of enthusiasm for anything and everything when you are depressed. Energy loss, and loss of interest in usual daily activities is a definite symptom of depression. Sadness envelops the mind, and puts a wet blanket over everything in life - making it near impossible to enjoy regular life. Depression simply robs you of pleasure. The link between depression and gastrointestinal issues is strong. Studies show that inflammation in the gut can lead to depression. It's possible that one day you can't get away from the bathroom, while other days you need a laxative to get things flowing again. Emotional distress can have a great impact on the digestive system. Keep this in mind if you are feeling any other symptoms of depression. The most common symptom of depression is the feeling that your worth and value have diminished. Oftentimes this can be caused by a failed relationship or failure in another area of life. Many believe that life could not possibly ever get better, and sorrow overtakes the mind. It is not uncommon for these feelings to lead to deeper and darker thoughts about suicide. Many people suffering from depression have a difficult time falling and staying asleep. This is because they are drowning in thoughts and are unable to switch their mind off and enjoy peace and quiet. Lack of sleep can directly affect mood levels and overall well-being. Depression can manifest itself in a multitude of ways. If you or anyone you know is suffering from any of the common psychological and physical symptoms listed above, it's important to consult a medical professional right away. Read more about depression treatments.